Processed pastry, manufactured meat…but hey – don’t knock ‘em till you try ‘em. 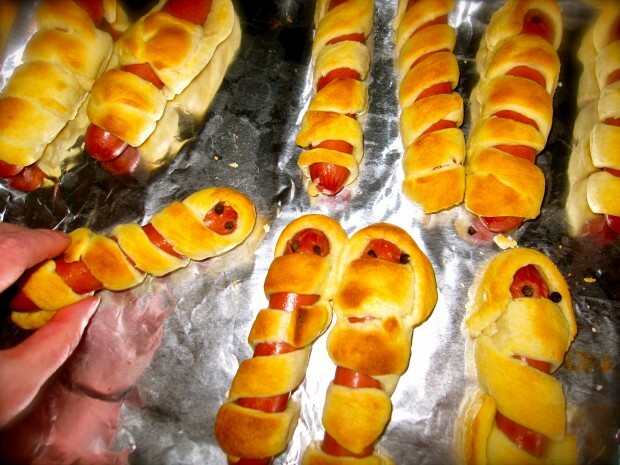 It’s a pity to only reserve this recipe for Halloween; Hot Dog Mummy Babies are a classic. I did choose a reduced-fat frank to make the babies, although I’m not convinced it really matters. ( I couldn’t use a turkey or chicken sausage as the casing color would be too similar to the bandages.) Unless you or a reputable butcher make them, who really knows what they shove into those casings. Perhaps the kosher brands are the best bet. Misgivings aside, my oh my, what a treat for Halloween! I retrieved this recipe from the Pillsbury recipe site. When recreating the site’s recipe, I deleted the cheese and used cloves for the eyes. 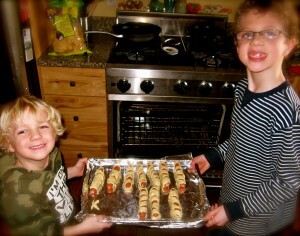 Bake 13 to 17 minutes or until dough is light golden brown and hot dogs are hot. 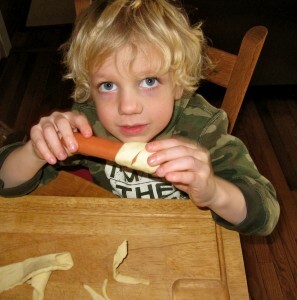 Insert cloves for eyes or dot mustard onto “face” for eyes, although cloves must be removed before serving.